Misallocation of capital looks unusually high at present as does the level of debt in the world. You would be forgiven for thinking that debt is a wholly reprehensible thing. Just think of the language of debt: it is a liability, an obligation, an encumbrance. Google gives over five million results for ‘bad debt’ – but only a tenth the number for ‘good debt’. But debt is not bad in itself. Debt after all is what you get when credit is given. Without credit, only the existing owners of capital can use it, and that is a perfect recipe for stagnation. So when commentators look back on the financial disasters of the last few years and talk about ‘toxic debt’ and ‘debt-fuelled spending’, it is good to recall that debt is also part of the creative economic force. But there is debt, and there is debt. Capital markets are no more efficient than other markets – which means that you can be sure that even in the best of times a substantial proportion of credit is assigned unproductively. The differential return from capital is of course part of the economic process: risk should attract a premium. But there are plenty of signs that in today’s world, where capital accumulation and the borrowing that comes with it is unusually high, misallocation is also unusually high. And this has plenty of implications for investors. Today, indebtedness is certainly very high in real terms. 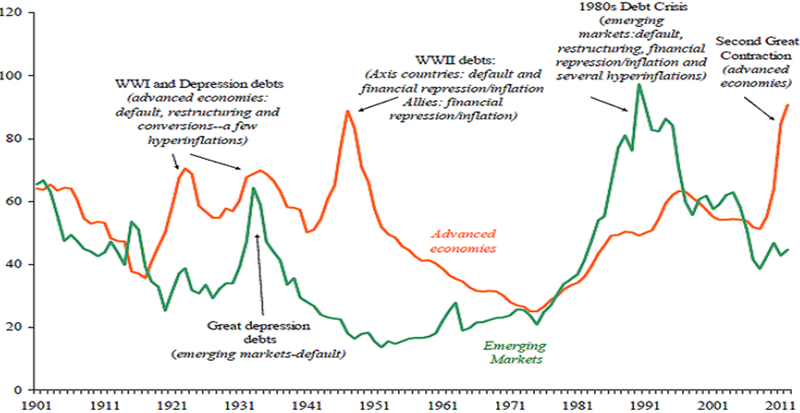 Total developed market sovereign debt is equivalent to well over 80% of GDP, significantly more than the previous high recorded in the immediate aftermath of World War Two, while emerging market sovereign debt is around its long-term average of 40% of GDP. Total world private sector debt is also at an all-time real terms high – 136% of GDP in 2010 according to the World Bank, having risen almost without interruption since 1980. That date – 1980 – is significant. The three decades that have followed have seen massive growth in emerging market economies. This growth has generated unprecedented imbalances in the world economy. First the newly industrialising countries built up huge sovereign debt balances of their own which eventually led to the emerging market debt crisis. The export boom that followed has seen emerging economies led by China build up trade surpluses that are equally unprecedented. 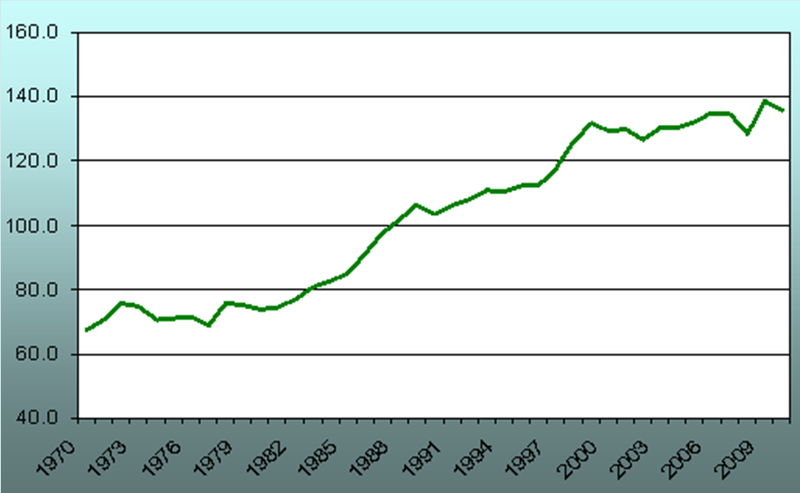 In 1980, China’s foreign currency reserves amounted to around 1% of the total of world reserves. Today the figure is over 30%. When governments pursue market share and export promotion policies, foreign reserves accumulate: that is what mercantilist policy does. And one by-product of this one-sided build up in reserves is a massive increase in debt – not only in the developed markets that import cheap manufactures, but also in some emerging economies themselves. Developed markets first. As is well known, exporters like China recycle part of their forex reserves into sovereign securities, primarily US and European bonds. Essentially, they lend developed economies the money needed to run the large current account deficits and to finance the domestic deficit spending that helps pump up demand and asset bubbles in the developed economies. But poor quality debt also accumulates in the export economies. China is an extreme case. When China’s central bank buys dollars and euros from exporters, it effectively increases the domestic money supply. That money has to go somewhere, and most of it goes into investment in one of the most over-invested economies in the world. There is absolutely no way of knowing the quality of these domestic Chinese debts: the data is too fragmentary and too opaque. Anecdotal evidence is the only evidence. And anecdotally, we hear that non-bank ‘grey’ lending mainly by state-owned organisations (which by their nature are unlikely to generate quality debt) now accounts for 22% of GDP. Another snapshot: two-fifths of Beijing’s apartments are not receiving electricity from the grid – that is, they are empty. China’s hidden debts and the developed economies’ all-too-visible debts are results of competitive globalisation. Yet since over timeeverything tends to revert to mean, today’s elevated levels of debt are almost certain to decline. The effects and the timing of this are incalculable, although history provides some clues. For example, what is in store for China? The only countries that have ever accumulated China-sized foreign reserves were the US just before the Great Depression, and Japan just before the onset of the ‘lost decade’: not encouraging precedents. Meanwhile in the developed markets debts must be cleared through write-offs and bankruptcies. If new investment is to follow (something clearly not happening today) the real return on capital has to rise. Interest rates have to rise, and a real rise in corporate costs across the board will follow. Many companies that look cheap today in equity terms will stop looking cheap. The age of over-gearing in saturated markets is closing. As developed market debt is unwound, borrowing in under-geared free-economy emerging markets that are really growing – Africa, central Asia and Eastern Europe – will rise. The developed world can delay the associated pain, but only temporarily. And any rational long-term investment strategy has to grasp this reality.